Harriet Cross arrived in Boston to become Britain’s Consul General in 2016, simultaneously taking up the post as the Club's Honorary President. Click here to learn more about Harriet. Peter joined the club in 2006 and has served as the treasurer since 2013. Peter is a former Royal Navy Weapon Engineer Officer, serving from 1983 to 1993. His career included time on HMS BOXER, HMS FIFE, HMS INTREPID, HMS YORK, and HMS CORNWALL. 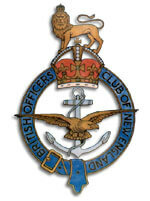 © 2019 British Officers' Club of New England. All Rights Reserved.